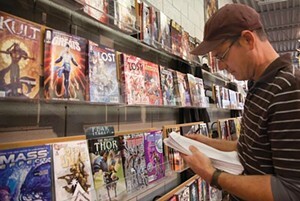 Comic booker: Phantom's Jim Guerriero checks the stock. Thanks to pop-culture representations in shows like The Simpsons, you probably have a mental picture of the average comic-book customer. But Jeff Yandora says there's really no such thing. "We get a pretty eclectic group in here," says Yandora, who owns Phantom of the Attic, a longtime fave with City Paper readers. "We get customers in here looking for stuff who, quite frankly, know more about the products than even I do. But then we also get the grandmothers coming in looking for presents, and we have to become detectives of sorts. They'll tell us, ‘I'm looking for a comic with a big red elephant, and I think Spider-Man is in it, too.' I'm proud to say that more often than not, we're able to help them find what they're looking for." Since being established in 1983, Phantom has been shuffled from one South Craig Street location to another. It was once part of a three-store chain, but the original owner broke them up and sold them individually in 1990. Yandora bought the Oakland shop, having worked there since 1985. The store's layout, like its clientele, may also defy your expectations. While there is a small section of boxed vintage comics, most of the space is dedicated to shelves and displays showing off the latest comic-book and graphic-novel titles. Phantom feels more like a cross between a traditional a bookstore and a gallery than a typical comic shop. Yandora says the move away from back issues and vintage titles has been a major change in the comic-book business in recent years. New titles come out every Wednesday and he sees a wide range of customers come into the shop. In addition to offering a plethora of well-known and independent comic titles, Phantom of the Attic saves room on its shelves for locally made comics and mini-comics. Aside from the obvious selections, like well-travelled comics artist Jim Rugg, the shop will take almost any locally produced comic on a consignment basis. Currently, Yandora says, the shop is selling a comic from artist Virginia Shields entitled "Words and Phrases for Getting Arahnd Pittsburgh." "It just riffs on the way people talk around here, but it's selling really, really well," Yandora says of the self-produced mini-comic. "Some sell better than others, but either way, it's a way for us to give back to the community and a great way to showcase all of the local talent that we have in Pittsburgh." Showcasing local talent is also a way for a brick-and-mortar store to continue to compete in an ever-changing publishing business. Yandora hopes the shop will be around another 28 years, but he knows the future will be determined by factors like the popularity of downloadable comics. "As long as there's a market for comics, we'll still be here," Yandora says. "But who knows, you could come back next year and we'll be a deli. Instead of selling Spider-Man, we'll make you a great Reuben."